Instructors may request the Instructor’s Manual for the book. § 1. Have something to say—and think it through. § 2. For maximal efficiency, plan your writing projects. Try nonlinear outlining. § 3. Order your material in a logical sequence. Present facts chronologically. Keep related material together. § 4. Divide the document into sections, and sections into subparts as needed. Use informative headings. § 5. Omit needless words. § 6. Keep your average sentence length to about 20 words. § 7. Keep the subject, the verb, and the object together—toward the beginning of the sentence. § 8. Use parallel phrasing for parallel ideas. § 9. Prefer the active voice over the passive. § 10. Avoid multiple negatives. § 11. End sentences emphatically. § 12. Learn to detest simplifiable jargon. § 13. Use strong, precise verbs. Minimize is, are, was, and were. § 14. Simplify wordy phrases. Watch out for of. § 15. Turn -ion words into verbs when you can. § 16. Avoid doublets and triplets. § 17. Refer to people and companies by name. Never use corresponding terms ending in -ee and -or. § 18. Don’t habitually use parenthetical shorthand names. Use them only when you really need them. § 19. Shun newfangled acronyms. § 20. Make everything you write speakable. § 21. Plan all three parts: the beginning, the middle, and the end. § 22. Use the “deep issue” to spill the beans on the first page. § 23. Summarize. Don’t overparticularize. § 24. Introduce each paragraph with a topic sentence. § 25. Bridge between paragraphs. § 26. Vary the length of your paragraphs, but generally keep them short. § 27. Provide signposts along the way. § 28. Unclutter the text by moving citations into footnotes. § 29. Weave quotations deftly into your narrative. § 30. Be forthright in dealing with counterarguments. § 31. Draft for an ordinary reader, not for a mythical judge who might someday review the document. § 32. Organize provisions in order of descending importance. § 33. Minimize definitions and cross references. If you have more than just a few definitions, put them in a schedule at the end—not at the beginning. § 34. Break down enumerations into parallel provisions. Put every list of subparts at the end of the sentence—never at the beginning or in the middle. § 35. Delete every shall. § 36. Don’t use provisos. § 37. Replace and/or wherever it appears. § 38. Prefer the singular over the plural. § 39. Prefer numerals, not words, to denote amounts. Avoid word-numeral doublets. § 40. If you don’t understand a form provision—or don’t understand why it should be included in your document—try diligently to gain that understanding. If you still can’t understand it, cut it. § 41. Use a readable typeface. § 42. Create ample white space—and use it meaningfully. § 43. Highlight ideas with attention-getters such as bullets. § 44. Don’t use all capitals, and avoid initial capitals. § 45. For a long document, make a table of contents. § 46. Embrace constructive criticism. § 47. Edit yourself systematically. § 48. Learn how to find reliable answers to questions of grammar and usage. § 49. Habitually gauge your own readerly likes and dislikes, as well as those of other readers. § 50. Remember that good writing makes the reader’s job easy; bad writing makes it hard. 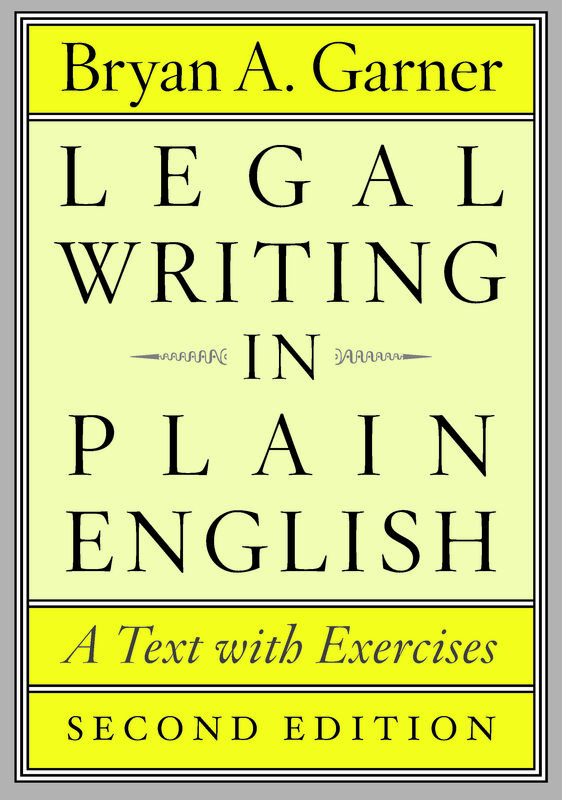 "This easy-to-follow guide is useful both as a general course of instruction and as a targeted aid in solving particular legal writing problems." "Garner’s work is a significant improvement [over other books] . . . . Those who are willing to approach the book systematically and to complete the exercises will see dramatic improvements in their writing."